Hailed by the New York Times as a "fascinating and important new historical study that examines . . . the place where the ways slavery is remembered mattered most," Denmark Vesey's Garden "maps competing memories of slavery from abolition to the very recent struggle to rename or remove Confederate symbols across the country" (The New Republic). This timely book reveals the deep roots of present-day controversies and traces them to the capital of slavery in the United States: Charleston, South Carolina, where almost half of the slaves brought to the United States stepped onto our shores, where the first shot at Fort Sumter began the Civil War, and where Dylann Roof murdered nine people at Emanuel A.M.E. Church, which was co-founded by Denmark Vesey, a black revolutionary who plotted a massive slave insurrection in 1822. As they examine public rituals, controversial monuments, and competing musical traditions, "Kytle and Roberts's combination of encyclopedic knowledge of Charleston's history and empathy with its inhabitants' past and present struggles make them ideal guides to this troubled history" (Publishers Weekly, starred review). 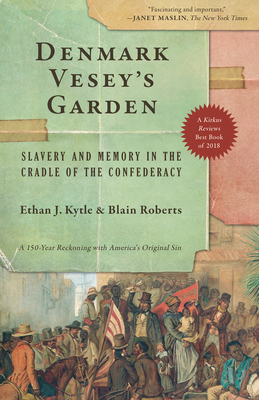 A work the Civil War Times called "a stunning contribution, " Denmark Vesey's Garden exposes a hidden dimension of America's deep racial divide, joining the small bookshelf of major, paradigm-shifting interpretations of slavery's enduring legacy in the United States. Ethan J. Kytle is a professor of history at California State University, Fresno and the author of Romantic Reformers and the Antislavery Struggle in the Civil War Era. Kytle lives in Fresno, California. Blain Roberts is a professor of history at California State University, Fresno and the author of Pageants, Parlors, and Pretty Women. She lives in Fresno, California.